Rajabu Chiwaya became known through auction in Paris whenre one of his paintings were sold for more than $50.000. To learn more, please read the article about Rajabu Chiwaya and Auction in Paris. Rajabu Chiwaya was born in 1951 in Nakapanya , a village in south Tanzania ca 70km east of town of Tunduru . He was Makua after his mother who was also born in Nakapanya. But his name originates from his father Lidumba Chiwaya who was from Ngoni tribe. He didn't even reach 50 years, when he passed away. As a young man Rajabu Chiwaya left his village and moved to Tunduru. He found soon a job as bicycle serviceman. He stayed in Tunduru for ca 6 years until he decided to try his luck in Dar es Salaam. It was Mzee Mruta, his uncle who inspired him. 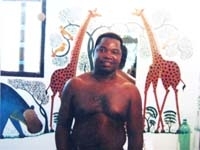 Bushiri Salum Mruta, the former policeman and relative to E.S.Tingatinga mastered already the skills of Tinga Tinga art when Rajabu Chiwaya arrived to Dar es Salaam in 1974. After Rajabu Chiwaya came to Dar he quickly embarked on the carrier as painter under guidance of Mzee Mruta. As other family members he worked in the new established Tinga Tinga Partnership Society which changed later the name to Tinga Tinga Arts Co-operative Society. Though the family was not rich, his income from sold Tinga Tinga paintings enabled him to establish a family of 14 children. The family stayed first in Msasani and then moved to Mbagala. After he passed away in 2004, some of his children continue in the legacy of his father. For instance, Mwamedi Chiwaya is one of most technically skilled painters at the Tinga Tinga Cooperative today. He is the third born child. Another two children who are painting in Tinga Tinga style are Ali Chiwaya Mawazo and Ilo Chiwaya. Two of his children were his students (Mwamedi and Mawazo) as well as Amury and Iddi Issa. It is not known where his works where displayed but they were shown all over the world. One of the places was Kendall's Gallery established by the well-known BBC newsreader Kenneth Kendall and his partner Mark Fear. They bought few Tinga Tinga paintings when they visited Tanzania around the year 2000. Rajabu Chiwaya also got a patron – the ambassador of Canada who loved his work. Maybe the reason was that Rajabu Chiwaya was precise painter mastering the details. He concentrated fully on the painting and took time in order to create a masterwork. It was the technical skill rather than new ideas which secured him steady interest in his work. Rajabu Chiwaya passed away in 2004, he did not reach his 50 birthday. He belongs to the Mruta family. S.Bushiri Mruta’s mother and Rajabu Chiwaya’s mother were sisters. Rajabu was born in Mindu, he started to go to basic school in Mindu but later continued in Nakapanya. He decided to come to Dar es Salaam in 1974 because of his uncle Mruta. He started immidiatelly a carrier as a painter. At that time there were just ca 15 painters; Tingatinga died in 1972 and left 6 students behind him. R.Chiwaya sold his paintings for double the price than other painters (he could sell for 500 Tsh while other painters sold for 100-200 Tsh). The paintings were technically perfect. Rajabu did copy his teacher Mruta who was his teacher but also put new themes into his paintings. Rajabu Chiwaya taught Mwamedi Chiwaya, Ali Chiwaya, Hapela Hashim and Amury Saidi. (They are still painting at the Tingatinga Cooperative). Most of R.Chiwaya’s paintings are painted on wooden sheets, few on canvas. Rajabu Chiwaya was married to Asalia Mohamed. He left behind 7 children. Now Mwamedi Chiwaya took over the responsibility for the family.